All images courtesy Mark Sublette Medicine Man Gallery, Tucson, Ariz. and Santa Fe, N.M. 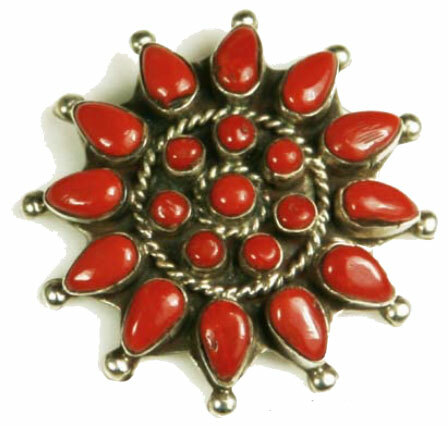 Roped and beaded silver and coral pin in “sunburst” shape, contemporary, 1.75.” Verso stamped “AB,” $300. 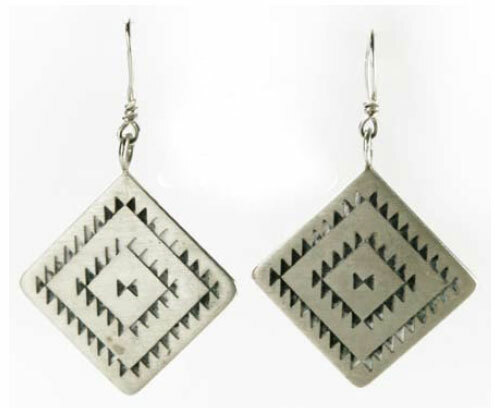 Though sales plummeted during the Great Depression, the Navajo silver market began to recover by the 1970s. Today, silversmiths produce traditional items like squash blossom necklaces, turquoise-studded pins and mother-in- law bells, which, by tinkling, warn sons-in-law of their impending arrivals. They also create specialized items like tie tacks, cuff inks, money clips, barrettes and watchbands - even collar corners that accent fashionable velveteen blouses. Silver overlay, French-hook earrings by Alfred Joe, c. 1990, 2.25" x 1.5", 15grams, $125. Coral and silver bracelet featuring round beads, by Herbert Begay, contemporary, size 7.375”, to include a 1.5” gap, bandwidth 1”, verso stamped “Navajo HSB Sterling .925,” $1,500.